A group of scientists led by the U.S. Department of Energy's National Renewable Energy Laboratory (NREL) in Golden and involving the University of Colorado Boulder has developed a new, eco-friendly method to produce ammonia, the main ingredient of fertilizer, using light. The researchers discovered that light energy can be used to change dinitrogen (N2), a molecule made of two nitrogen atoms, to ammonia (NH3), a compound of nitrogen and hydrogen. The researchers hope the newly discovered, light-driven chemical process that creates ammonia can lead to future developments that will enhance global agricultural practices while decreasing the dependence of farmers on fossil fuels. Traditionally there have been two main ways to transform nitrogen, the most common gas in Earth’s atmosphere, for use by living organisms. One is a biological process that occurs when atmospheric nitrogen is “fixed” by bacteria found in the roots of some plants like legumes and then converted to ammonia by an enzyme called nitrogenase. The second, called the Haber-Bosch process, is an industrial method developed a century ago that changes N2 to ammonia in a complex chain of events requiring high temperatures and pressures. The Haber-Bosch process requires the significant use of fossil fuels, resulting in a corresponding hike in greenhouse gas emissions. Led by NREL Research Scientist Paul King, the new paper appears in the April 22 issue ofScience. CU-Boulder co-authors include Assistant Professor Gordana Dukovic of Department of Chemistry and Biochemistry, former doctoral student Molly Wilker, now a faculty member at Luther College in Iowa, and current doctoral student Hayden Hamby. Funded by the Department of Energy (DOE) and NREL, the study also included researchers from Utah State University (USU) and Montana State University (MSU). As part of the study the team showed that nanocrystals of the compound cadmium sulfide can be used to harvest light, which then energizes electrons enough to trigger the transition of N2 into ammonia. 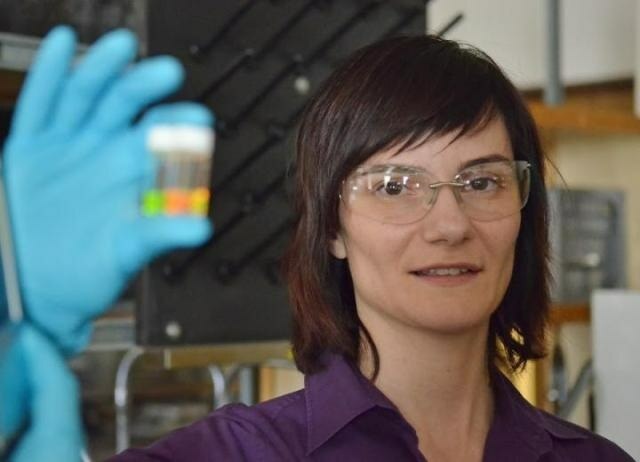 “The key was to combine semiconductor nanocrystals that absorb light with nitrogenase, nature’s catalyst that converts nitrogen to ammonia,” said Dukovic, who received a prestigious Sloan Research Fellowship in 2014 and who was named a National Science Foundation CAREER Award winner in 2012. “By integrating nanoscience and biochemistry, we have created a new, more sustainable method for this age-old reaction,” she said. Other paper co-authors include Derek Harris, Andrew Rasmussen, Nimesh Khadka and Lance Seefeldt of USU and Stephen Keable and John Peters of MSU.